This interactive visualization was created using Tableau. 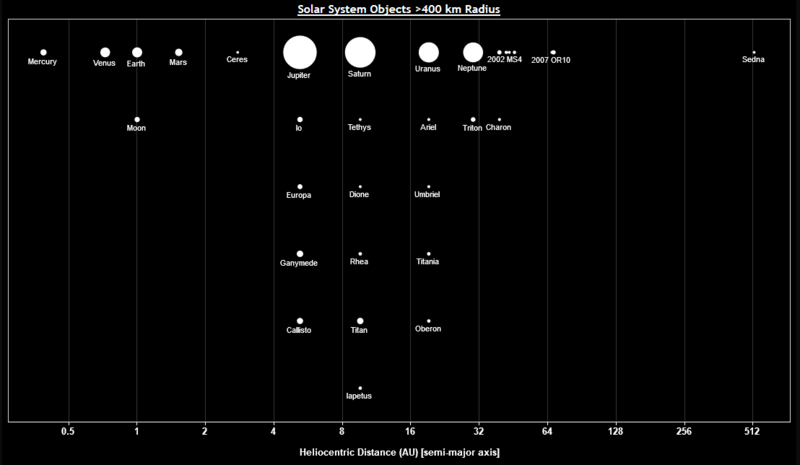 All known objects with a radius greater than 400 km are represented along a logarithmic scale of their orbital semi-major axis (heliocentric distance in AU). The slider at the bottom allows you to select a range of heliocentric distances to zoom in on. Hovering your mouse cursor over an object will show additional information. Planets with moons or co-orbiting objects are lined up vertically (sharing the same heliocentric distance). These are listed from top the bottom in order of the Galilean naming convention (e.g. Jupiter I = Io, Jupiter II = Europa, Jupiter III = Ganymede, Jupiter IV = Callisto) excluding objects with a radius < 400 km. Also note that the size of the circles representing these objects are not to scale.